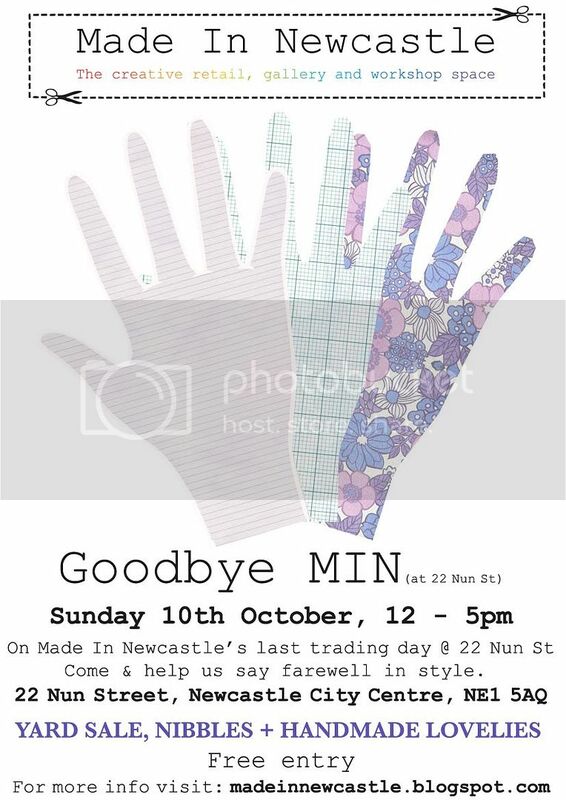 Sunday is Made In Newcastle's last day of trading. I've mentioned them a few times on this blog, from their collective work as the Newcastle Craft Mafia at The Cluny to opening for business full time as a pop-up shop in the City Centre. Shops like MIN are so important and refreshing, especially in a city like Newcastle where we can be a bit short on independent retailers (Notable exceptions are Maverick, Electrik Sheep and our many vintage shops) especially ones which stock local designers and artists. Sadly, their short term license is up and the landlords have found a "commercial tennant" (rumours are it's going to be another generic shop selling tacky Christmas decorations...like we need anymore!) so tomorrow is a bittersweet goodbye. Pop along between 12-5pm for some nibbles and a 'yard sale' to raise money for their next venture. Also happening on Sunday is the another Judy's Affordable Vintage Fashion Fair. I don't think I've missed one of these yet in Newcastle, and have attended two in Leeds. They're the best for having amazing offers for vintage clothes, which can have their prices jacked right up in shops. There's also a 'tea room' with cupcakes and other baked goods, and stalls by local independent designers (such as one of my favourites, The Libertarian). Even if you're not from the North East, check out the website to see if there is an event happening soon where you live. They now trade in 18 UK cities, so there is bound to be one reasonably close by. I would however like to point how that I won't be tucking into delicious cupcakes at the fair, since I'm now on a healthy-eating-and-lots-of-exercise kick. I told Daniel I'm doing 30mins-1 hour of aerobics a day and he responded with "WHY?!! I couldn't think of anything worse!" He has a point. Luckily I still have my Pump It Up Dancemix DVD which is the BEST WORKOUT VIDEO EVERRRR. God, I love Gareth the choreographer . 'Dancemix 1' is the best - "Say NO NO NO to your man! Alright come here! Flick that hair and pose for the paparazzi!" I'm not even joking. Anyway yeah. No cupcakes for me - just a delicious Kellogs Fibre Plus bar. Because that's the same. *le sigh* At least it has chocolate on it. Anyyyyway, folk usually attend dressed up in their best attire, so there is lot of people watching to be had even if you're a bit broke like me. So there you go - if you see me at either of these PLEASE say hello! I promise I'm dead nice. I really wish there were vintage fairs up here in ABERDEEN! I would love to go to one. We have overpriced Vintage stores here which is gutting and I can never find anything amazing in my size (18). I wish there was amazing vintage fairs where I live! Looks like a fun time! I didn't notice the URL on the picture at first, so you did a good job of making it subtle but still visible.